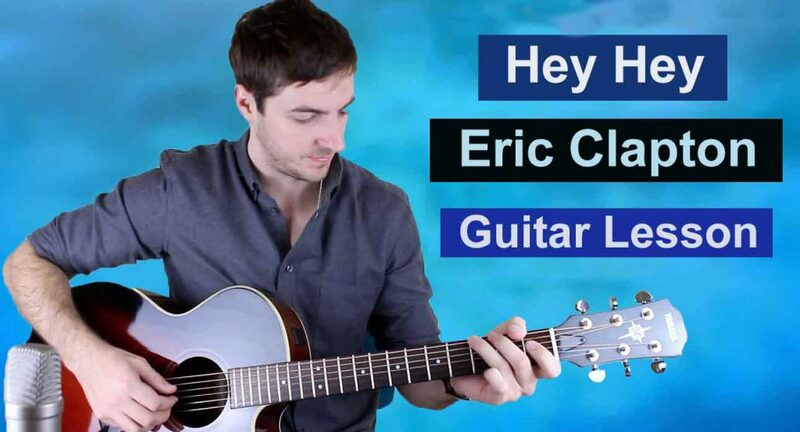 Scroll down for full fingerstyle guitar lesson (with tab/video tutorial) of Hey Hey by Eric Clapton. Hey Hey was originally written by Big Bill Broonzy in 1951 and Eric Clapton's cover of the song can be found on his massively successful live album 'Eric Clapton Unplugged', recorded in 1992. Hey Hey is no. 47 on my Top 60 Fingerpicking Songs of ALL TIME list. If you've not seen the list be sure to check it out and sign up to my weekly email lesson. That way you won't miss learning any of these great fingerstyle songs. The song is a straight up 12 bar blues in E and it's a terrific one to learn for aspiring fingerstyle blues players. Although the chord structure is very simple and repetitive throughout, it's certainly not an easy tune to master. It's fast, demanding on the right hand and moves all over the neck. Having said, that once you do get it together it's a lot of fun to play and it sounds fantastic! Hey Hey is made up of just two parts, both of them are built with the exact same 12 bar chord structure. The first part is the instrumental section (kind of the riff) that opens the song and reappears after every sung verse. The second section is the 12 bars where Clapton sings. You don't have to play this part as I've written it, note-for-note. If you watch Clapton play the song you'll notice he mixes things up often. This is very typical among blues players, so instead see this as a template to work from. Your lessons are fantastic! A little fast at times, but I think this has more to do with my older fingers than anything you’re doing. With the holidays approaching, do you have any favorite holiday songs that play well as fingerpicking tunes? Also, I am jumping around your Top 60 list learning songs I appreciate most. Outside of your courses, I am learning “Just Breathe” by Pearl Jam. It is simultaneously simple and complex – a beautiful song. I am interested in seeing your interpretation of this song – a lesson would be helpful to me with respects to mastering the nuances. I saw your Beatles fingerpicking video – will your course expansion include some of these songs? I am not sure if you take requests – just sending you mine. Keep up the great work! Really glad that you like my lessons. I am planning on doing some Christmas stuff of course. I’m hoping to do 12 fingerstyle songs, but it all depends on having the time arrange them. Until the top 60 list is complete I can’t do any more song lessons, but I’ll certainly add it to my ever increasing song requests list! It won’t I’m afraid, but possible I will add more songs to the course as time goes on. I would love to do (and probably will) individual lessons on all those Beatles songs.